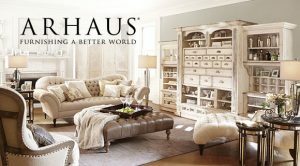 The Arhaus Rewards Program allows cardholders to earn points for shopping at Arhaus and receive special access to exclusive promotions. Clients can choose special financing and/or earn 1 point for every dollar spent on the credit card. There is no cap to the reward amount cardholders can earn! Eligible cardholders are automatically enrolled in Arhaus Rewards upon making a qualified purchase with their credit card. They started their business in 1986 with a passion to provide unique, high quality, well-designed home furnishings. Every Arhaus piece meets high-quality standards. Their furniture is Cherry, Elm, and many other natural hardwoods. Natural stone table tops. 100% organic cotton fabrics. True wrought iron beds, made with forged iron using time honored methods and uncompromising handwork.